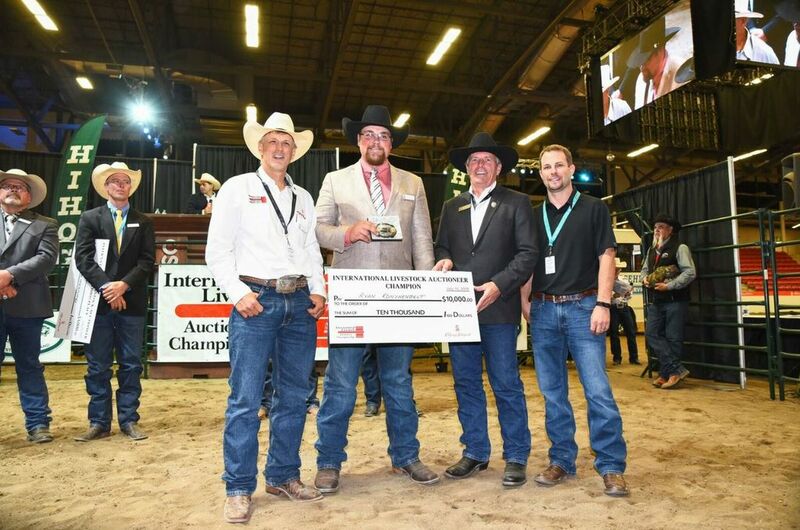 CALGARY — The judges heard Ryan Konynenbelt’s sales pitch loud and clear at the Calgary Stampede’s International Livestock Auctioneer Championship on Saturday, placing the 21-year-old competitor in the top spot. The former Rookie of the Year topped a field of 36 competitors from as far afield as Australia and South Africa at the event held in the Nutrien Western Event Centre. Konynenbelt, who works at Southern Alberta Livestock Exchange in Fort Macleod, started his career at the age of 16, selling items in a church fundraiser. The Champion win earned him $10,000 and a Stampede belt buckle. It also came with a buy into next year’s World Livestock Auctioneer Championship in Visalia, California, where he’s sure to employ some of the knowledge he gained at the International Livestock Auctioneer Championship. The 36 fast-talkers first faced off in Friday’s qualifier at the Olds Auction Mart. The top 10 scores from the preliminary round were then carried over to the finals in the 30th anniversary of the event. While selling four head of cattle and a black box item — ranging from a Kobe beef package to chuckwagon tickets — in Saturday’s final, the auctioneers were marked by a five-member judging panel on a variety of criteria, including rhythm, livestock knowledge, and repartee and timing. Kyle Layman of North Platte, Nebraska talked his way into Reserve Champion ($2,000 and a belt buckle), while the Rookie of the Year title and accompanying belt buckle went to Tim Yoder. Despite his relative newcomer status, the auctioneer from Montezuma, Georgia made it to the finals. While Rob Bergevin didn’t make it to the top 10, he can sell it all: cattle, cars, chuckwagon canvases. But the competitor reserves some of his best sale talk for the art of auctioneering itself. If you’re from Alberta, chances are you’ve heard Bergevin’s patter. He’s conducted the Stampede’s Chuckwagon Canvas Auction for almost two decades. It’s a high-stakes, high-pressure event, and even after all those years, Bergevin still gets a few butterflies before he sets the sale in motion. When Bergevin worked at the Calgary Stockyards in the ’80s, he was encouraged to try his hand at auctioneering. After attending college south of the border, in 1988 he started down a career path that led to him being the current president of the Livestock Markets Association of Canada, in addition owning Foothills Auctioneers with his wife, Sharon. He’s also a member of the Stampede’s International Livestock Auctioneer Championship committee. That commitment to community is evident in all that Bergevin does. A team roping competitor for more than 20 years, he co-founded the Millarville Rodeo back in 1996. He had to step away from the sport in 2007 as he couldn’t leave Foothills Auctioneers for months to travel the circuit. (“I still miss it on a nice sunny day,” he said.) Bergevin keeps his hand in the rodeo world, acting as a pick-up man, primarily for bull riding. But auctioneering always has been and always will be his passion. Visit ag.calgarystampede.com/results for full results from the Calgary Stampede’s International Livestock Auctioneer Championship.